The title is misleading. I picked it up and thought “Oh wow, maybe it’s like Diablo or a dungeon run in World of Warcraft…” then I started playing it and man was I wrong. Dungeon Raid pits you in a puzzle game where you trace tiles, gather swords to fight monsters, and collect money to level up skills and powers. It’s like a text based RPG adapted into a puzzle game like Bejeweled or other match-3 games. Brought to us by Fireflame Games, Dungeon Raid is available on the iPhone, iPod touch, and iPad for $2.99. Gameplay has you sliding your finger across multiples of the same tiles. You have different tiles which all serve a different function. Shields provide you defense points that absorb damage from your health, potions which heal your health, coins that allow you to buy new upgrades, and swords which increase the strength of your attacks. Wait? Attacks? Health? That leads us into the most important tiles: The skulls. These represent monsters with health scores and attack strength. Anytime they are on the screen, after each of your moves (assuming they aren’t killed) they will attack you. Your shields block some damage but eventually your health will start lowering. You have to balance gathering swords to increase your attack power in order to trace over the enemies and deal more damage. Healing, multitasking the collection of coins and potions in order to get a 3+ in-a-row chain of tiles, and fighting enemies all compile into one heck of app. It actually get so frantic, it starts to feel like a real RPG. The tiles are beautifully drawn with small details and a cartoony look. Upgrades, items, enemies, and the general user interface look really good and are easy to understand at first glance. The pot of ‘blood’ that represents your health is big and easy to read, and all together, it’s well executed and easy to play. No real issues for a color blind reviewer. With the gameplay being enjoyably challenging, the level up system provides you with lovely bonuses that really do play a big role in gameplay. 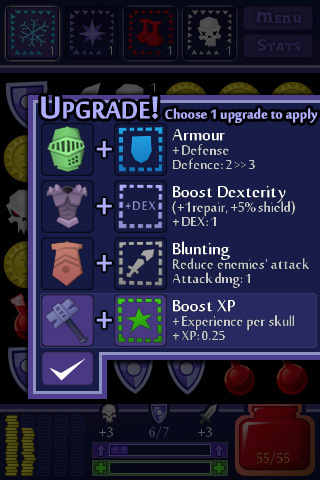 Upgrades and items help to deal with enemies when you can’t make an opening to attack them, and sometimes, making the choice of quickly killing a large amount of enemies or healing for the next attack can be exhilarating. With its really well done, well planned interface, Dungeon Raid is a spectacular way to interpret a standard RPG. Really creative. I would really like to see some more graphical ‘beautifications’ though. How about when you buy a new weapon, it changes the tiles in-game into that weapon? Maybe enemies could have different skulls or faces to add variety to their appearances? Maybe the health pot could be a customizable object so you can go from a vile to a pot to maybe a well armored magical goblet or something. Pick this one up. For its price, they definitely made me feel like it was well worth the money in so many ways. 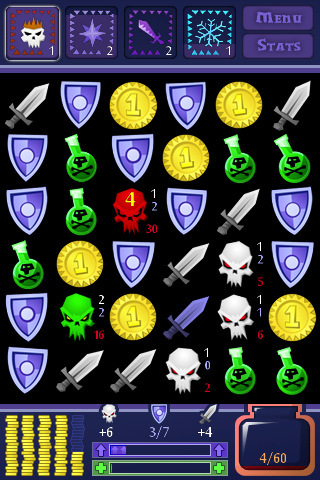 Try Dungeon Raid and see how many levels you can reach, how much gold you can get, and how many enemies you can slay! AppSafari review of Dungeon Raid was written by Joseph Ho on December 17th, 2010 and categorized under App Store, Featured, Fun, Games, Line Drawing, Puzzler, RPG, Strategy. Page viewed 5597 times, 4 so far today. Need help on using these apps? Please read the Help Page.